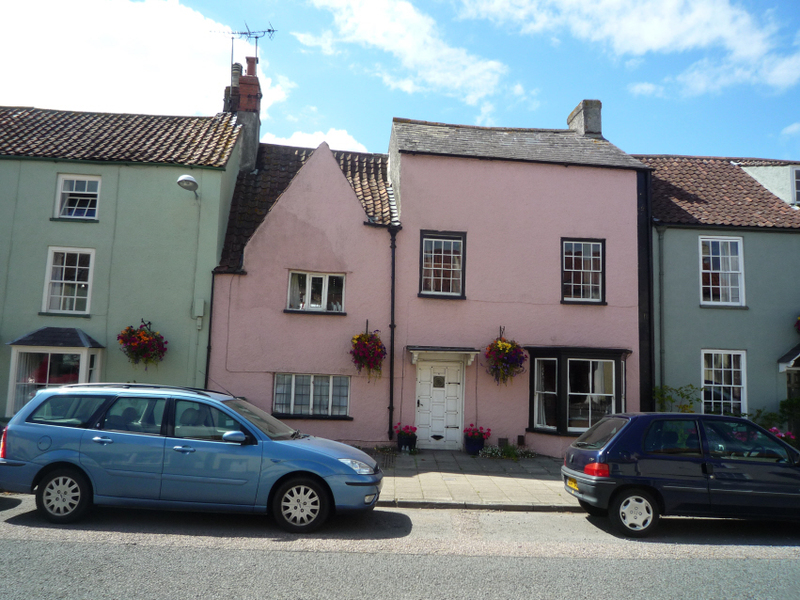 Number 60 High Street is the pink house in the photograph above including the gabled part of the house. The older photograph below shows the house to the right of the steam lorry. Click on the thumbnail to see a larger image. It is interesting to note that the older photograph appears to show a pair of windows at the top of the main part of the house that no longer exist in the present property. There is a similar change in the gabled section which also now lacks an upper window. The bulletin of the Society of Thornbury Folk printed in December 1947 referred to a stucco medallion which could be seen on the front of the house – with the inscription ‘I.E. …96’. This medallion can just be seen at the top of the gable in the photograph. It was thought it might indicate the owner and date when built, but unfortunately the whole date was missing. The medallion fell apart when the house was being renovated by Norman Tucker in the late 1940’s. It was however reported that a coin with heads of William and Mary was found in the house during the restoration work and it was assumed therefore that the date would likely to have been 1696. According to the Images of Britain website, the left hand part of the property is mid-late 17th century and that the right hand part was re-modelled and enlarged in early 19th century. We haven’t seen the deeds of the house and our knowledge of its history only goes back to the early 1800’s. We are able to identify the house in the early records because the 1840 Tithe Survey shows that the house was then owned and occupied by George Cossham. The Cosshams – the 1809 Rent Roll shows the house was then owned by Ann Cossham. Ann was the widow of Jesse Cossham who died intestate in 1797 aged 41 years. The Land Tax records suggest that Jesse’s property was passed to his widow, Ann. We know from the land tax records from 1825 onwards that the property became owned by Jesse and Anne’s son, George Cossham (see below). We have no record of Anne’s death but we assume that she died around 1825. We know from the rate books that following the death of George’s wife, Mary in 1876 his house was passed to Fanny Wise. Fanny was the widow of George’s nephew, Jesse Wise, who had died in 1875. Fanny Wise – the 1880 and 1885 Rate Books show that Fanny Wise was the owner of the property. The 1880 Rate Book and 1881 census show she was living there. The census shows Fanny was a widow aged 54 born in Thornbury. She was living with her daughter, called Fanny E. Wise, an upholstress aged 27 who was born in Bristol and two boarders, Robert Cotton, a grocer’s assistant aged 22 from Freshwater in Hampshire and Charles W. Wells, a solicitor’s clerk aged 21 born in Thornbury. Interestingly Charles Wells seems to have had another occupation as the trade directory for 1885 shows that he was the treasurer and secretary of the Thornbury Reading Rooms. The 1881 census also indicates that Fanny was sharing the house with Charles Browning and his family. Charles was a retired draper aged 43 born in Bath. He was living with his wife, Frances aged 41 from Liverpool and their niece, Mary Greenway aged 6 from Hambrook. Charles had moved to Thornbury to take over as landlord at the Beaufort Arms at 57 High Street, but in 1880 he had handed over this role to his son-in law. Alfred bought the house at auction in May 1890 for £232 10s. The house was then let to F. J. Williams for £15. Alfred never lived there but let it out to tenants. In his will dated 14th March 1895 he left the house then occupied by F. J. Nalder to his son, William Daniel who worked as a carpenter. William Daniel had never married and in the 1901 census he was living with his widowed father at 5 Pullins Green. Clement Williams – the 1905 Rate Book shows that the house is occupied by Clement H. Williams. Clement was born in 1876, the son of Frederick James Williams, the sanitary inspector who had been living here in the late 1880’s and early 90’s (see above). In 1901 census Clement had been living with his parents at their home in Chapel Street. Clement was a coal and builder’s merchant and he had his depot at the Railway Station. An advert listing his products appeared in the 1904 Brown’s Almanac. It is interesting to see the vast range of products sold by Clement – not only coal and coke, choice of bricks, tiles, cement, chimney pots, pipes, toilet seats etc but also a large range of glass and chinaware. The advert also showed that he already had a telephone, one of the first private ones in Thornbury – his number was ‘5’. Click on the thumbnail on the left to see the full image. In 1904 Clement married Beatrice Louisa Barrett. They had several children. A son, Clement Francis, was born in 1906 but he did not survive. In 1907 Clement was declared bankrupt and had to give up his business. A court case questioned how Clement had disposed of his household furniture which had disappeared one night and he claimed these belonged to his wife. He was also questioned how he came to be trading under the name of ‘Williams and Son’. He admitted that his trading partner was his three months old son who had died. They had three other children: Frank James P. was born on 8th August 1907, Clement Oswood born on 5th January 1908, and Robert K born in 1913. The Council School records show that Clement was living in St Mary Street between 1915 and 1919 when their children started at the Upper School. He died aged 51 and was buried in Thornbury Cemetery on 8th February 1927. The burial record describes Clement as a labourer. Beatrice Louise died aged 50 and she was buried in Thornbury Cemetery on 10th January 1928. The Warrens – the 1907 Rate Book shows that Rowland Warren was now occupying the house. Rowland Richard Warren was born in Redcliffe area of Bristol on 5t September 1870. His parents were Richard and Elizabeth C Warren. In 1881 census the family were living in 8 Oakfield Place, Clifton where Richard was employed as a poulterer, a dealer in poultry and poultry products. They were still there in the 1891 census by which time Richard had become a lodging house keeper and young Rowland was employed as a Clerk to the Medical Officer of Health. In 1894 Rowland married Isabel Thrush in Clifton. Isabel was born in Chew Magna in 1860. She was the daughter of Charles Thrush, a groom and coachman and his wife, Isabella. In 1891 she was living in Park Street, Bristol and employed as a mantle maker. Rowland and Isabel had three children: Rowland Charles born on 29th October 1895 and baptised at Westbury on Trym on 23rd November 1895, Albert Claud born on 15th November 1896 and Isabel Victoria born on 15th November 1899 and baptised at Westbury on Trym on 10th December 1899. In the 1901 census they were all living at East Hill Cottages in Westbury on Trym. 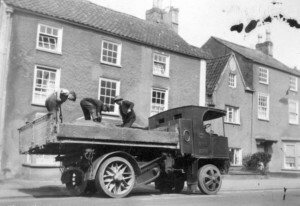 Rowland and Isabel moved to Thornbury from Westbury in 1905 when their two sons, Rowland Charles and Albert Claud started at the Council Upper School. The family’s address at that time was shown as Chapel Street. It appears that Isabel started by going to a Private School but transferred to the Council School as well in 1907 when the family’s home was the ‘High Street’. The school records note that little Isabel was also known as ‘Queenie’ at that time. All three children did well at school and progressed to the Grammar School. The school records show that Rowland Charles left in 1908, Albert Claude left in 1912 to be a Junior Clerk in a Solicitor’s Office and Isabel left in 1916 to be a bank clerk. Rowland came to Thornbury when he was appointed as Relieving Officer to the Board of Guardians. He carried on in this position until April 1936. Notes held by Thornbury Museum mention that Rowland owned a pony and trap and the pony had to be taken through the house to a shed in the garden. Isabel died on 23rd April 1936 at the age of 76 after she had been an invalid for a long time. She was buried in Thornbury Cemetery on 27th April 1936. Of their children: Isabel died on 17th January 1921 aged 21. The notice printed in the Chronicle indicates that she was known as ‘Queenie’. In 1923 Rowland Charles married Agnes C. Neale in the Chipping Sodbury area. In August 1937 Albert (known as Bert) married Lilian Mary (Molly) Davies, the daughter of F. W. Davies of Belmont, 36 High Street. Bert and Molly had a son, Anthony Richard born on 1st October 1941, but he died at St Andrews Nursing Home after six days. Anthony was buried in the family grave in Thornbury Cemetery on 11th October 1941. In 1938 Rowland married Ada M Knight. She was born on 23rd March 1870. Rowland died in Bristol Royal Infirmary aged 71. He was buried in Thornbury Cemetery on 12th February 1942. The 1946 electoral register shows that Ada was still living in Severn View which was the name given to 60 High Street. It also shows that Albert and Lilian were listed as living in the High Street – it is possible that they were living at Severn View, although they might have been living at Belmont with Lilian’s mother. A report in the Western Daily Press dated 4th August 1947 shows Ada was still living at Severn View when she was taken to Bristol Royal Infirmary after falling down some steps at her home and fracturing a wrist. The 1925 Valuation list and the 1926 Rate Book shows that ‘F. Williams’ owned the property. We are not sure which F. Williams this refers to or when and for how long he owned the property. The Champions – the house was occupied by Reg and Dorothy Champion from 1954 onwards. We know that they lived here for almost 50 years. Reg (whose full name was Herbert Reginald) was born on 30th July 1909. He was the son of Reginald Arthur Champion and his wife, Charlotte Golding (nee Williams). We can’t trace the family in the 1911 census. The school records for the Council School indicate that the family must have moved to Cheltenham for a short time as Reg and his brother, Francis Arthur (born on 18th August 1905) attended school in Cheltenham before transferring to Thornbury Council School in 1917. At that time the family’s address was in Silver Street. Both boys progressed on to Thornbury Grammar School at which time their father was noted as being a clerk. The school records note that Francis left in 1920 to enter an engineering firm because his parents could not afford to keep him at school. When this business failed, he worked for his grandfather’s (Francis James William) florist and seedsman business. A newspaper report dated 1922 shows he been appointed to serve in the Royal Air force as a Boy Mechanic. Reg left the Grammar School in 1924 having obtained the Cambridge School Certificate. The records note that he took up an apprenticeship in a chemists in Thornbury and intended to enter college to qualify as a chemist and that ‘his parents were anxious to not miss the chance of an apprenticeship as such a chance not likely to offer itself again’. According to the report of his wedding in the Gazette Reg left Thornbury about 1929 (before which time he had been a member of Thornbury Town Football Club). He went to London and joined the police force, where he became a member of the C.I.D. He married in London in 1933 in St Peter’s Church in Fulham. His wife was Dorothy Lucy Alice Hyde. She was born on 13th January 1911, the daughter of Mr and Mrs F Hyde of Sherbrooke Road Fulham. According to the newspaper they spent their honeymoon in Thornbury. In the special register compiled in 1939 in preparation for the war Reg and Dorothy were listed as living with his parents at The Seed Supply, 21 High Street. They had two children, Susan born in 1946 and Andrew born in 1949, both born in the Fulham area of London. The family had returned to live in Thornbury by 1954 where both their children went on to attend Thornbury Grammar School. We are not sure if Reg owned the property. He did have connections to the Williams family whom we know to have been the owners in 1926, although we don’t know who owned the place in the time after 1926. When Reg returned to Thornbury he joined his brother, Frank, in the running of the family shop at 21 High Street, just above the Swan. At various times the shop was known by the names of Williams, Williams and Champions and Champions. There were two parts to the shop, on the left it sold fruit and vegetables and on the right it sold seeds etc. Reg’s brother, Frank, lived at 13 Church Road with his wife, Kathleen (who may have been known as Kay). I was fortunate enough to get to know Reg around 1970 when he had retired from the police force and he got a job as clerk/storeman in the depot of Thornbury Rural District Council. He was a delightful man, always polite, well-spoken and obviously well educated. He enjoyed his work and mixing with the council workmen. In later years he would always stop for a chat when he bumped into you in Thornbury and took an interest in you and things happening in Thornbury. He died in January 2001 aged 91.